Capitol View has made convenience a priority due to our limited office hours. With these online and mobile tools members can manage their accounts, deposit checks, pay bills and transfer funds to and from third party accounts. Explore all of these tools and see why Capitol View is no less convenient than a national bank. various online and mobile tools. Home banking is our primary online tool, from which members can view account balances, download transaction history, transfer funds, make loan and credit card payments, request check withdrawals, and manage a budget. In addition, home banking provides access to various other Capitol View online tools & systems including online bill pay, Capview Connect, MyCard Info, eStatements, and account alerts. Enroll for Home Banking, here. Once your request has been received, a staff member will enable your account and issue you an initial password so you can begin the enrollment process. 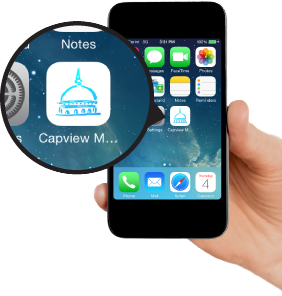 Capitol View’s mobile application, Capview Mobile, is a powerful on-the-go tool to manage your accounts. With our mobile app, members can view account balances, recent activity, transfer funds, and access our mobile deposit tool. Our app is available on Apple and Android smartphones or Apple, Android, and Windows tablets. Visit the respective app store and search, “capview” or “capitol view”. View Mobile Banking Agreement and Disclosure. 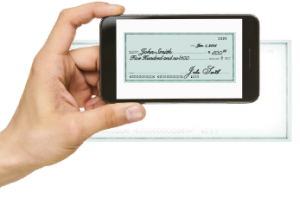 Now you can instantly deposit checks to your checking account using your smartphone. Members who have an active checking account can access the tool from the checking screen in our mobile app. Simply select the camera icon and follow the instructions. Funds are typically available the same day or within one business day. Endorsing Your Check: Please endorse your mobile deposited checks with your name, the text “Mobile Deposit“, and the date. It is recommended that members retain a copy of any mobile deposited checks for at least 30 days. Mobile check deposits are subject to a minimum 2-day hold. View Mobile Banking Agreement and Disclosure. *Members must have a checking account and be in good standing. Capitol View reserves the right to restrict access to the mobile deposit tool or reject deposited items for any reason including delinquency or abuse. Simplify your bills by consolidating them onto one platform with our online bill pay tool. This flexible tool allows you to create one-time or recurring bill payments to individuals, small businesses, or corporations. Save time and save money with this free tool. Online bill pay is available from within home banking for members who have an active checking account. Depending on the payee, bill payments will be delivered either electronically or with an automated paper draft. Members have the ability to schedule payments based on their budget and due dates. Certain eligible bills can be setup for e-bill, which automatically receives your bill statement within the bill pay tool. This also allows your to easily setup automated, recurring payments. Mobile Bill Pay NOW AVAILABLE on Capview Mobile App! Members can now access, edit, and setup new bill payments from within our mobile app. Simply select the new bill pay icon, , which is found on your account screen. From there, you can swipe left and right between your current payees. To add a new payee, go to settings and select, “Manage Payee”. New payments can easily be setup or edited from each payee’s screen. *You will need to enroll for Bill Pay through Home Banking prior to accessing it through the mobile app. Access Online Bill Pay from within Home Banking or Mobile App. Capview Connect is Capitol View’s secure funds transfer tool. Members are able to link to their accounts at other financial institutions for account-to-account transfers or even setup individuals for person-to-person transfers using their email or cellphone number. Using the A2A feature, members can setup accounts at other institutions within Capview Connect. Once those accounts are activated in Capview Connect, members are able to transfer funds to and from those outside accounts. Transfers typically take 2-3 business days to finalize, however expedited transfers are also available at an additional cost. It is easier than ever to transfer funds to and from individuals using the Capview Connect P2P tool. Members can send or request money from anyone using their email address or smartphone number. They will receive notification of the request and are able to securely and anonymously input what account they want used for the deposit/withdrawal. Whether you have a friend who borrowed $20 for lunch or they covered your share of a group gift, Capview Connect’s P2P tool is an easy and secure solution. Access Capview Connect from within Home Banking. MyCard Info is Capitol View’s MasterCard management tool. It enables members with a Capitol View MasterCard to review their recent MasterCard statements, download activity, notify us of travel plans, and more. Access MyCard Info from within Home Banking. Simply follow the “Credit Card” link on the account balances page of home banking to access the MyCard Info tool. Save room and paper when you sign up for electronic statements. When you sign up, your future statements will be saved securely within our home banking tool for up to 12 months. Members can easily view and download eStatements for their records. Contact Capitol View to switch to eStatements. Access eStatements from within Home Banking. Capitol View offers a wide variety of customizable account alerts within home banking. Members can create alerts based on a range of categories including account balances, loan payments, online access, or even check clearing notifications. Alerts can also be setup to be delivered as an email or a text. Setup custom account alerts in home banking under the ‘Accounts’ tab to stay on top of your accounts. Don’t have a smartphone? You can still stay connected using our voice response system. Voice response gives you a secure alternative to our mobile app and home banking for account balances, transfers, and more. To enroll, contact Capitol View for an initial voice response PIN then access the system by calling 515-226-7997 or toll-free, 1-800-879-8350. *ENROLLMENT PROCESS UPDATE: Our Voice Banking system was recently updated to include additional security features. If you are a current voice banking user you will need to re-enroll using these added features. Select (*) to begin the enrollment process. You will need your current PIN code and account number. Contact us at 515-348-8350 with any questions.